I call this the ‘Cherry Fizz‘. Homemade cherry simple syrup, seltzer, prosecco, and rum. This is the perfect ‘meet me by the pool’ cocktail. A few weeks ago I started playing around with some beer cocktails. I made a Bull’s Eye Beer Cocktail that turned our fantastic! Keeping in mind that I wanted to make another cocktail, I was always on the lookout for new non-beer ideas for cocktails. Then it happened – while shopping I came across something that I loved when I was growing up, New York Seltzer. My favorite after-school treat was a little bottle of this flavored seltzer and Pringle chips! I felt like a kid again seeing these in what happened to be the liquor aisle of my grocery store. I already had a bunch of cherries in my refrigerator that needed to be used up, a bottle of prosecco that I had picked up from Costco and of course what do most ‘summertime’ drinks contain? Rum. Thus, the cherry fizz was born! With the cherries that I had leftover, about 2 cups, I made a simple syrup. 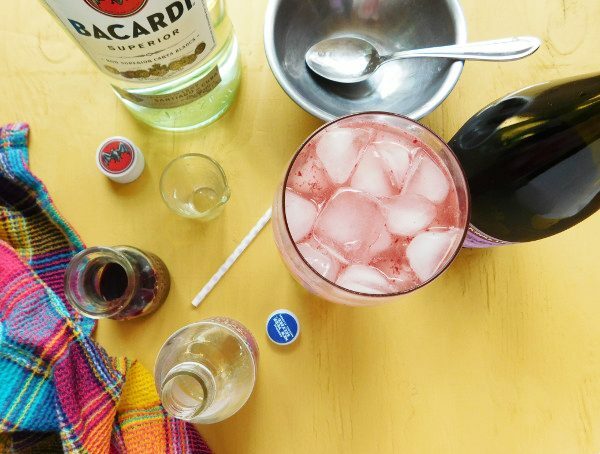 This adds an extra layer of fruit flavor and sweetness to the drink. Do know that a little goes a long way when adding it to drinks. Take the stem and pit out of the cherries and add them to a food processor. Once they are thoroughly mashed add them to a pan with 1/2 cup of water and 1/2-1 Tbs of sugar. Cook the mixture down until it thickens, around 20 minutes. Take the mixture and add to a container and let cool. This will last in the refrigerator for drinks up to 2 weeks. 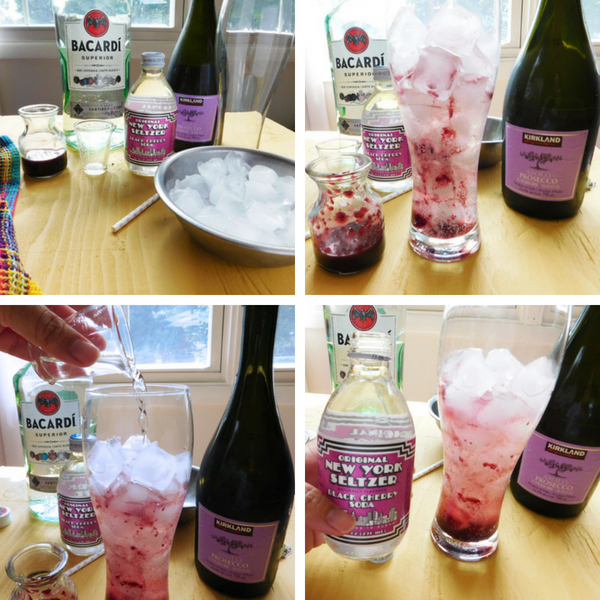 Make this cherry fizz in an individual glass or you can make in larger batches to share with friends and neighbors. For the glass recipe; add 1/2 Tbs of cherry simple syrup to a tall glass filled with ice. Add 1/2 cup of prosecco. Then add 1/2 shot of white rum. Finally finish the drink off with the seltzer, around 1/2-1 cup. Stir to combine and here you are…..
From our home in the Bottom Left of the Mitten to yours ~ Cheers! 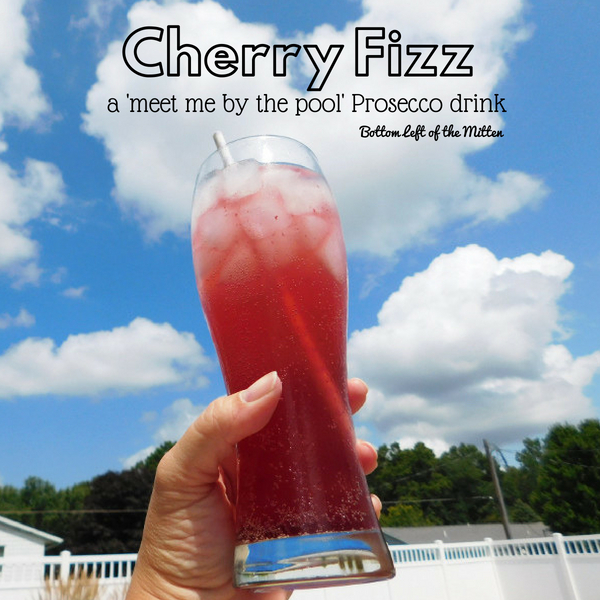 Seltzer, prosecco, white rum and cherry simple syrup make this Cherry Fizz a bubbly drink that's perfect for hanging out by the pool. Add 1/2 Tbs of cherry simple syrup to a tall glass filled with ice. Add 1/2 cup of prosecco. Then add 1/2 shot of white rum. Add the seltzer, around 1/2-1 cup.